Did plants evolve colourful flowers to attract insects? Did organisms evolve camouflage to avoid predators? Are all members of an individual species identical? The theory of Evolution (Darwin called it Natural Selection) is one of the most important ideas in Science – certainly in Biology – and explains how living organisms change over time. Unfortunately, it is, in general, poorly understood and poorly explained by its proponents. The word evolution comes from the Latin evolutio which means unrolling. It is generally understood as meaning a progressive change in a particular direction – that direction being better or more advanced from the previous form. This is wrong. Evolution doesn’t mean “improvement” is simply means “change”. All three of those statements are false and dangerous because they imply a deliberate and intentional progressive development. The words evolution and adaptation are being wrongly used. We should instead be using an expression like “propagation of advantageous survivability traits” – which is a much more accurate description of what is happening. No population of organisms is uniform. Every individual in a population is slightly different (even identical twins have different fingerprints). There are many small differences and sometimes a few individuals have large differences. There are physical differences in size, weight, pigmentation, etc. There are also many small biological and metabolic differences (some people are lactose intolerant). These differences can be the result of mixing characteristics (we get half our DNA from our mother and half from our father), transcription errors (improperly copied DNA – commonly called a mutation), or transpositions (when a piece of DNA from one strand is grafted onto another). Most changes are harmless and provide no survival benefit and just get lost in the “noise” of variability in the population. Some changes are not harmless and severely affect survivability. As long as an individual in a population can pass their characteristics to the next generation, those characteristics will remain. Plants did not evolve colourful flowers to attract insects. Plants which had colourful flowers attracted more insects. 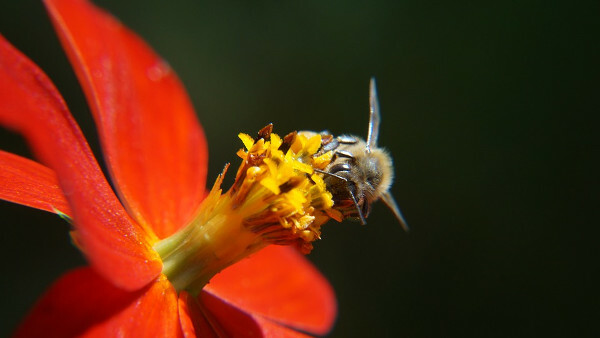 Since insects preferred to visit colourful flowers, they pollinated them and thus encouraged their propagation. Plants with dull drab flowers, being ignored by the insects, died out. Organisms did not evolve camouflage to evade predators. Organisms which were harder for predators to find had a higher survival rate and consequently passed their characteristics to their descendents. Those that did not hide well from predators were gobbled up and their genes removed from the gene pool. 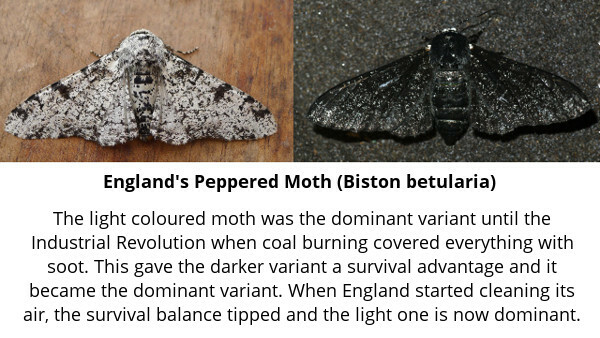 The Peppered Moth of Great Britain is a recent example of camouflage evolution. The Peppered Moth comes in two colours: grey and black. Before the industrial revolution, the grey moths were the dominant ones, since they blended nicely into the bark of trees as they rested. The black ones were rare because they stood out and were easier for predators to find and eat. Following the Industrial Revolution, when lots of coal was being burnt and everything was covered in soot, the black ones had the advantage and the grey ones became rare. A species does not adapt to its environment. Either the species, or some members of the species are able to survive in the new environment or not. If not, the species dies. For example, if food is scarce, those organisms which cannot get enough food will starve and die. Those that are able to get enough food will survive and pass their characteristics onto the next generation. So which ones get enough food? Is it the smaller organisms because they need less food to survive? Is it the more aggressive ones who can fight for and win the food? Is it the ones with a slower metabolism because they can live on less food? Is it those that can eat something else and get enough nutrition? We don’t know. We can make a guess that smaller organisms with a slower metabolism will survive better than others in the population, but the true answer will come after many, many generations and we see the evolutionary result. Evolution seems to happen most quickly when there are rapid environmental changes. When things are stable, the random variances in a population do not have any survival advantage. Which organisms are least likely to survive? Slow reproducing organisms because they cannot introduce genetic diversity fast enough for natural selection to take place. This is why dinosaurs are extinct. This is why large mammals are dying off, they cannot cope with rapid changes. There is an upper limit on how fast change can occur before a population of organisms is unable to cope with the changes and dies off. Darwin’s idea of survival of the fittest doesn’t mean the biggest or strongest or fastest or most intelligent, it simply means the survival of those organisms that best fit their environment. Sharks do well in oceans, not so well in trees. Evolution is not about how an individual organism changes, but about how the general population of organisms change over time. In stable environments, organisms change extremely slowly – if at all – because they are already well adapted to their environment. The coelacanth is a good example – it was thought to have gone extinct about 66 million years ago, but was discovered alive in 1938 in the Indian Ocean off the coast of South Africa. 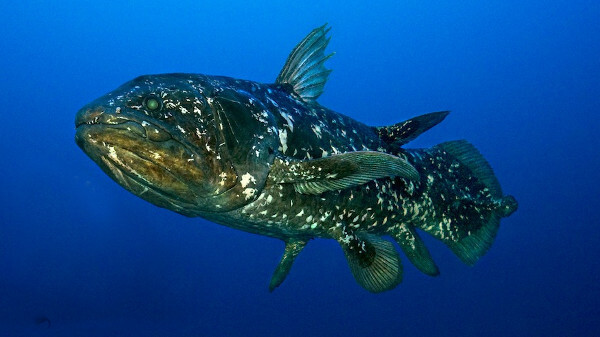 While there are differences with fossilized remains, the coelacanth is remarkably unchanged. Its slow rate of change is, probably, because it lives in a stable environment with very few predators – so there are no strong selection pressures. Evolution doesn't mean "improvement", it just means "change"
"Survival of the fittest" means "fits their environment best"